This spring a few of the NMI team members decided to take team building to the next level. 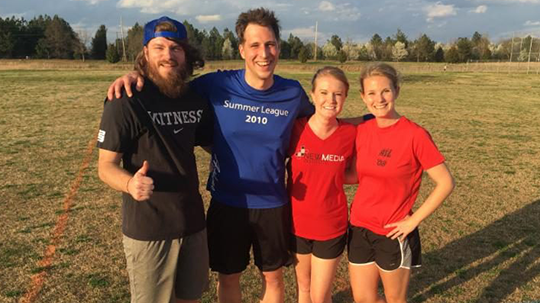 John Weatherford and Lauren Baggett were veterans of the local ultimate frisbee league and convinced Chris Gerlach and Megan Ward to join in for the spring season. Though united at the office, John and Chris competed against Megan and Lauren as their teams battled it out for bragging rights each Monday night. Who came out on top? It’s up for debate, but a great time was had all around.